Some time ago I was asked if I was interested in testing one of Abel & Coles Free Range Chickens and who was I to say no? I must admit that I was a bit worried about having a chicken delivered and sitting outside until I made it back home from work. Especially since I was getting it delivered during quite some hot weather. I didn't need to worry. The chicken was delivered in a sturdy insulated box and was packed together with a frozen gel pack. It was still well chilled by the time I got home. Their whole chickens are reared by a number of growers but I couldn't find any information as to exactly where this specific bird had grown up. Not that I really need to know the exact farm or the name of the farmer. The chicken came complete with the giblets if you want to use those. I used mine to make some Louisiana Dirty Rice. There's quite a lot you can do with a whole chicken, most of them illegal in the state of Massachusetts, but I decided that roasting it would be a good way of comparing it to the chickens I normally cook/eat. I used exactly the same methods and timings as I normally do when I roast a whole chicken, trying to be as fair as possible. I must say that I was surprised by the end result. The bird itself looked healthy, or as healthy as a dead chicken can look, before I started cooking it but what came out of the oven surpassed my highest expectations. This was one of the juiciest and most well tasting roast chickens I've ever cooked/eaten. 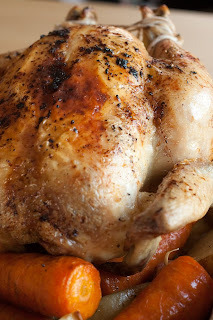 It reminded me of roast chicken dinners I had as a child with chickens from my first cousins farm. I know that people say that free stuff always taste better but I must say that I will gladly pay for this quality in future. The Abel & Cole Free Range Chickens are a couple of pounds more per kilo than what you pay for normal supermarket chickens but I must say that I think it is well worth it. I had a very nice roast chicken dinner and then I used the leftovers for chicken sandwiches the next day. Very tasty chicken sandwiches as that. Mikey says: I highly recommend you trying one of Abel & Cole's Free Range Chickens. I don't think you'll regret it. Glad to read another review of the A&C chicken - mine is on my blog a few weeks back - as I too was impressed with the taste and texture. I have also tried some of their red meat and been blown away by the beef in particular. I was sent the wrong cut so have another on the way which I am sooo looking forward to! Not sure what's different with these chickens to the other free range I've tried but they're damned good! Sounds like I need to give their red meat a go too. Yah, read my reviews of the lamb and beef... totally delicious! Åh! Skinnet ser då där perfekt krispigt och saftigt ut, jag kan känna smaken i munnen!